As I have mentioned before, you can buy anything here in Thailand, and I mean ANYTHING (or anyone), but still, no Velveeta! The only cheese readily available is made in Australia. That stuff stinks. It has this strange smell to it, as if it is already gone half bad. I can get good cheeses in Bangkok at a shop that my friend Jan goes to. We even have an "in" for good cigars, through his buddy Paul, and a friend in Holland. But still, no Velveeta! I have even found a lot of great cheese recipes on the internet, for making real cheese at home. But still, no Velveeta! As this is Superbowl weekend, and I do get a fair amount of sports on the TV, I though it would be cool to have nachos. I can get Doritos here, and the girls have never had Mexican food, so I thought that might be a fun thing to make. A few weeks ago, I started searching seriously for "da cheez". I now have a very good friend named Kathleen at the Kraft company 's consumer help dept. The only thing we could come up with, was a pack of Velveeta singles (12 slice). But they wanted over $7 for 1 pack. Plus, the shipping was almost twice that! Are you kidding me? $21 for fake cheese? 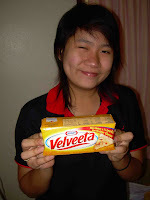 The other day, I got an email from Kathleen, in which she said that she had found Velveeta online. It turns out, that you can buy a 2 lb. block of "Kraft Premium" cheese on Amazon.com. Haaaaa! Who new? Kathleen says that it is the same as Velveeta, but just in a fancier box. The only downside is that it costs $22, but, it's 2 pounds, so that is much better than the slices. I wouldn't be able to get it in time for the Superbowl obviously, but it's nice to know that it is there. My next search is going to be for Lasagna noodles. They seem to be a bit scarce here also. But that may have to wait until I actually find a real oven, or at least a microwave.